Women should target acquiring higher education as a key tool to empower themselves in the society, speakers told a roundtable. They also called for changing men's attitude towards women and proactive actions by the stakeholders to uphold women's dignity and rights. 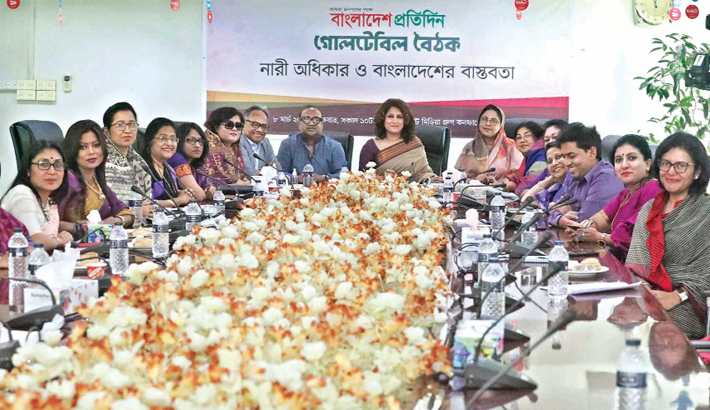 Vernacular daily Bangladesh Pratidin arranged the roundtable at the conference room of East West Media Group (EWMGL) in the capital's Bashundhara Residential area on Friday on the occasion of the International Women’s Day. Dhaka University Associate Prof Samia Rahman hosted the meeting while Bangladesh Pratidin Executive Editor Peer Habibur Rahman made address of welcome. Kaler Kantho Editor Imdadul Haq Milan gave vote of thanks. Meeting participants are Former State Minister for Women and Children Affairs Meher Afroz Chumki, member of parliament Sagufta Yasmin Emily, former MPs Nilufar Chowdhury Moni and Nurjahan Begum Mukta, National Press Club General Secretary Farida Yasmin, security analyst Mohammad Ali Shikder, entrepreneur Rubana Huq, lawyers Salma Ali, Elina Khan, Turin Afroz, Dhaka University Prof Zinat Huda and Robayet Ferdous, Economist Nazneen Ahmed, Chhatra Union former President Lucky Akter, actress Bonna Mirza and singer Anima Roy. Former State Minister Meher Afroz Chumki said the women have proven their excellence in leadership position in different areas as the political parties have empowered them in the last one decade. Former lawmaker Nilufar Chowdhury Moni disagreed with the progress of women in political arena as the political parties are far away, according to her, to ensure one third of female participation in all committees as of election commission direction. JPC General Secretary Farida Yasmin suggested bringing the issue of dignity of women in academic text for developing respect among new generation. Lawyer Turin Afroz said the women are yet to remain unpaid as they contribute at home as well as at workplaces. “We have to develop our daughters from family as they get confident on own vision from early girlhood. Family members and nearer ones have significant responsibilities towards a girl’s journey towards success,” Farida added. Citing some survey figures, Dhaka University Prof Zinat Huda said Bangladesh is the best country among South Asian nation in terms of gender equity. Kaler Kantho Editor Imdadul Hoque Milon focused on changing mindset of man to lead their better half to success. Bangladesh Pratidin Executive Editor Peer Habibur Rahman appreciated the leadership of Bangladeshi women in field of politics. He also suggested women politician to be more sincere about norms and activities at the parliament.